From the late 1930s and all the way through to the last Cabinetmakers' Exhibition in 1966, A J Iversen showed furniture designed by Ole Wanscher. A number of variations were produced of chairs in this style, one with a deeper back rest and another with a bowed front to the seat. This form of chair remained popular through the 50s and 60s - with the back rest running round into the arm rests and the curve supported at the front by the front legs taken up as posts. 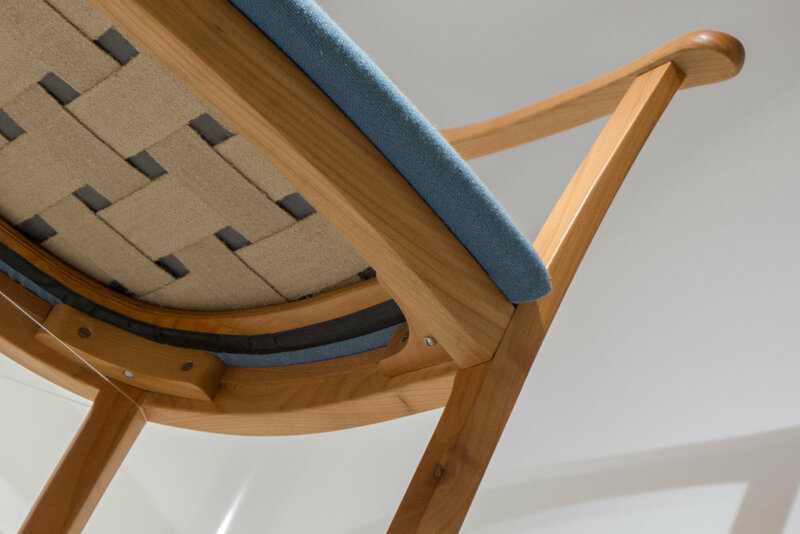 This gives the frame of the chair structural integrity so, although the legs are relatively thin and certainly elegant, the construction is so precise that stretchers can be omitted. The upholstery for the seat is interesting with a thin pad with what appears to be an internal plywood frame with canvas webbing to form a thin profile and the main rails of the seat itself are relatively shallow so the chair is remarkably elegant … compare this with, for instance, the chair by Kaare Klint for the Thorvaldsen Museum with a deep seat rail to form a more robust chair or with the Faaborg Chair from 1914 to which it is obviously related. In the view from below it becomes clear that the front, back and side rails of the seat are separate pieces that are housed into the legs. The back legs are set an angle so the square cross section of the legs are flush with the curve of the back and there are blocks of wood across the inside to reinforce the join where the wood of the frame of the seat is housed into the legs and these blocks also support the upholstered seat itself. Similarly, at the front, curved angle pieces or brackets reinforce the join of the side frame and front frame to the front post and again provide the main support for the seat. The back rest and arms are formed from four pieces of wood with a tight zig-zag join and like several of the chairs designed by Wegner the back rest is thicker and vertical but where the wood curves round into the arm rests these are thinner and set flat but the effect it so subtle here that it is far less sculptural - far less dramatic. The outer ends of the arm rests swell out slightly in width and are rounded off. 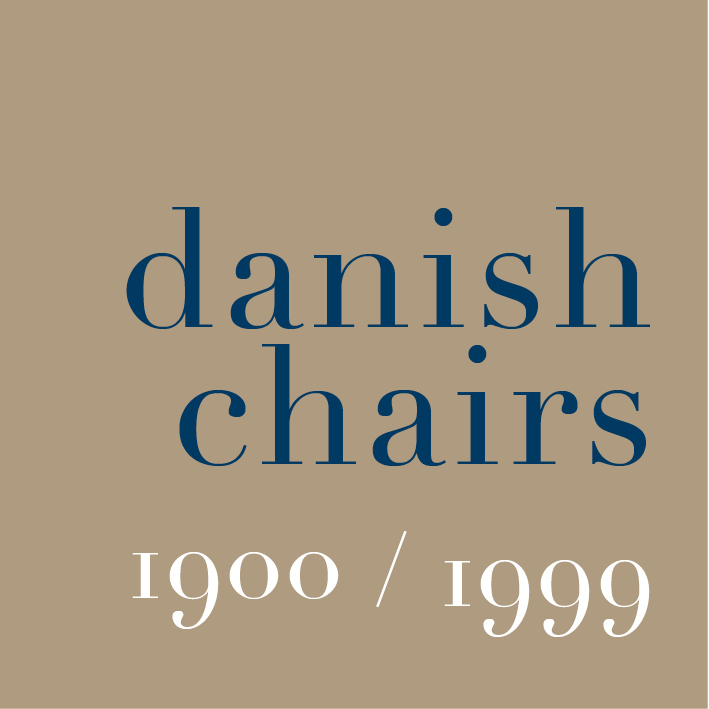 Perhaps the strongest feature is the continuous horizontal line of the underside of the back rest and arm rests that, with the straight and horizontal line of the front rail of the seat, gives the chair a certain sharpness or sense of line that marks it out clearly from work by Juhl or even from designs by Wegner. The front legs are vertical but above the front rail of the seat they taper in thickness and curve outwards slightly to the sides and the back legs or rather the back posts are curved for the full height in a gentle arc so their silhouette, with the leg curving out and away to the floor, is a late echo of the Klismos form. As a student, Ole Wanscher studied under Kaare Klint at the Danish School of Art and Design and then, from 1924 until 1927, worked with Klint before establishing his own office. On the death of Klint in 1955, Wanscher succeeded him as professor at the Royal Danish Academy of Fine Arts and remained there until his retirement in 1973. A J Iversen was a major figure in the guild of cabinetmakers and he is recognised as one of the great furniture makers of the 20th century but this partnership with Wanscher can be seen, with hindsight, as marking the end of an era. Jacob Kjær, another major figure in the guild, had died in 1957 and this period is marked by increasing doubts and rising pressure as the furniture factories became more and more powerful and as the demand for good furniture meant more and more a demand for good design but at a price more people could afford.